2. Unroll the pastry sheet and place on a baking tray. Scatter with half the Parmigiano cheese. 3. 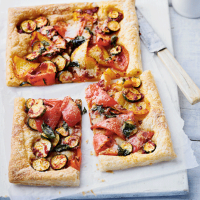 Mix together thevegetables and tomato paste and spread over the pastry leaving a 2cm gap round the edges. Scatter over the remaining cheese and basil and bake for 20 minutes until golden.